David’s documented field experience in astronomy, paleontology and archaeology has made him an in-demand speaker with expert knowledge and his powerful and inspirational delivery makes learning about Bible history and science fun and easy for audiences of all ages. David’s weekly TV show “Creation in the 21st Century” airs to millions globally on TBN. He is a weekly news columnist on science and the Bible, and is author of the books “Wonders Without Number” and “Bible Knows Best.” Featured on the History Channel, and heard on talk radio, David’s exciting life and world travels are documented on his ministries’ active Facebook page. Morning Seminar #1—Bible Knows Best– Hidden Gems of Astoundingly Good Science and Sound Advice in the Scriptures. This seminar covers the remarkable migration of the Arctic Tern, the Paths of the Sea, germ theory, the stretching of the heavens, complexity of DNA, dinosaurs in the Bible, and more. Afternoon Seminar #2—Exploring God’s Creation– From the Dead Sea Scrolls to clams in Kansas, Global Biblical proofs through exploration. Through photos and video, travel to sites with David and learn of caves and cavemen, historical research in Jerusalem, the Dead Sea Scrolls and Qumran, and dinosaur paleontological excavations that document the global flood. This entry was posted in DHF of NC Happenings on April 4, 2019 by dhfofnc. The DHF of NC Leadership Council met at First Christian Church Richlands with six members present: Judy Rose, Rev. Betty Stowe, Robert Reynolds, Ray Randall, Rev. Kenny Connor and Rev. Lynn Maxwell. The meeting was opened by Pastor Kenny Connor sharing a devotional emphasizing the need for having a response to temptation in place before the temptation occurs. “If you ignore the rain, you may get wet….if you ignore God, you may wish you were wet!” He used Joseph as an example of having an “escape plan” when he ran from Potifer’s wife leaving her holding his coat in her hand. 1. Rev. Lynn Maxwell presented the Minutes from the last Council Meeting which were approved as read. 2. Betty Stowe, Treasurer, provided a financial summary for calendar year 2018. 3. Robert Reynolds opened the discussion with a request for nominations for a Council Leader. Pastor Kenny Connor nominated Rev. Lynn Maxwell, and Judy Rose seconded the nomination. The vote was unanimous to accept Lynn as our new Council Leader. 4. Lynn presented a list of recipients of Hurricane Florence relief funds from DHF of NC, and read thank you cards they had sent. First Christian Church Decatur, Illinois sent a donation of $2,500 after Hurricane Florence that was used to help five families. Bridgeton Christian Church was mentioned as possibly still needing assistance to fully recover. Betty will check with Bridgeton Christian for their current status, and Lynn will try to contact their Pastor to offer to bring a DHF of NC presentation. A motion was made, seconded and approved to pre-authorize Betty to donate up to $1,000 to Bridgeton Christian Church for flooding repairs if needed. 5 Betty reported that a member of Unity CC had suffered substantial flooding during Hurricane Florence, and was still struggling to complete home repairs. The Council agreed to send that member a $500 donation from DHF of NC funds. 6. Lynn announced that Tuckahoe Christian Church is hosting a “Love and Respect” conference March 8th and 9th, and encouraged attendees to spread the word to their respective churches. 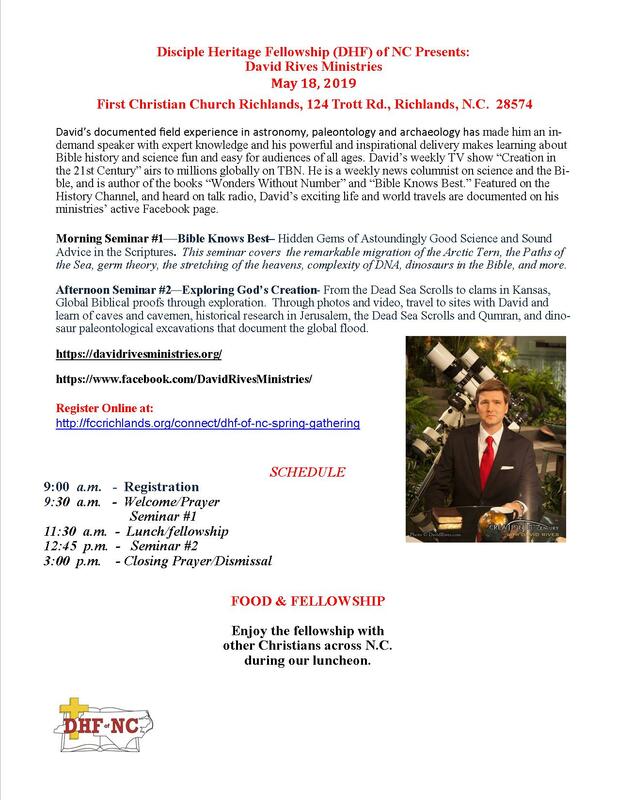 Creationism in 21st Century IF it’s not too late to schedule David Rives to come speak in April or May. Danny will contact David Rives Ministries.Fall Gathering – We will ask Wayne Kent again to speak (he was scheduled last Fall but the Gathering was cancelled due to Hurricane Florence). 8, DHF of NC Scholarship Fund: Betty furnished a copy of Unity Christian Church’s plan for Scholarships and explained its particulars. Lynn asked Betty if she would revise the plan to apply to the Council’s desire to initiate a DHF of NC Scholarship Program for Seminary students. Betty agreed and will provide a draft to the Council which will serve as a starting point. 9 Lynn asked all the attendees to encourage folks from their respective churches to attend the DHF National Conference April 5&6 at First Christian Church in Decatur, Illinois. Our meeting was closed in prayer by Lynn Maxwell. This entry was posted in DHF of NC Happenings on March 12, 2019 by dhfofnc. We believe love best motivates a woman and respect most powerfully motivates a man. Research reveals that during marital conflict a husband often reacts unlovingly when feeling disrespected, and a wife reacts disrespectfully when feeling unloved. We asked 7,000 people the question, “When you are in a conflict with your spouse or significant other, do you feel unloved or disrespected?” 83% of the men said “disrespected” and 72% of the women said “unloved.” Though we all need love and respect equally, the felt need differs during conflict, and this difference is as different as pink is from blue! This entry was posted in DHF of NC Happenings on February 9, 2019 by dhfofnc. Due to the anticipated flooding and disruptions from Hurricane Florence, we have decided to cancel and reschedule our Gathering for a later date. Please be safe, and look forward to a new date/time for our Gathering. This entry was posted in DHF of NC Happenings, Posts on September 13, 2018 by dhfofnc. Please see the below poster announcing our FALL GATHERING on Saturday, September 22, 2018. If you are a DHF of NC Church you should receive a sign-up sheet to use to register your people. But, there is also an online sign-up sheet located on FCC Richlands’ Web Page. Click on the following link “REGISTER” and it will take you to the registration page. This entry was posted in Uncategorized on August 29, 2018 by dhfofnc. The DHF of NC Leadership Council met with five of our council members present along with a host of visitors from Otway CC, FCC Richlands, Tuckahoe CC, and Pleasant Hill CC. We also welcomed Harry and Beth Niser from Bath, NC. We were also thrilled to have two visitors from Walstonburg CC in Walstonburg, NC. Mrs. Carol Taylor and her Sister, Susan Dietrich, came to find out what DHF is all about. Our special guests for the day were Rev. Wayne Kent and Mrs. Leslie Kent. Wayne is the new Executive Director of DHF and is the Senior Pastor of FCC Decatur, Ill.
Our meeting was opened by Elder Danny Bailey who shared his recent experience at the Billy Graham Cove along with his wife Irene, Rev. Kenny Conner and his wife Debbie and their Son and Daughter-in-law. The speaker was Will Graham, Franklin Graham’s Son. The topic was “Satan’s Snares and God’s Blessings” based on 1 Samuel chapters 18-20. Lynn Maxwell gave the financial report provided by Rev. Betty Stowe who was unable to join us for the meeting. There were two nomination forms submitted for new council members to replace our two outgoing council members: Rev. Jack Mumford, Otway CC, and Elder Danny Bailey, Amity CC. The group heartily thanked these two individuals who have served our council faithfully since its inceptions, and both were a part of the original team that worked to establish DHF of NC. The two nominations were: Elder Judy Rose from Otway CC, and Rev. Lynn Maxwell from Pleasant Hill, CC. The two nominees were approved by the Council. Their names will be submitted to all DHF of NC Churches for approval. If approved, they will be affirmed at our Fall Gathering on Saturday, Sep. 22, 2018. At the next Leadership Council following the Fall Gathering, the Council will appoint a new leader for the council. Lynn recommended that Elder Danny Bailey take over the position as Secretary of the council. The recommendation was approved by the council. Danny will assume this role at the next meeting of the council. As Secretary, Dany will attend all council meetings but will not be a voting member. We are very grateful for Danny’s willingness to serve in this capacity. The major topic of the meeting was to finalize plans for our DHF of NC Fall Gathering, Sat., Sep. 22, 2018 at FCC Richlands. We are very happy to have Rev. Wayne Kent as our guest preacher for this event. We are doubly blessed to also have Leslie Kent to sing at our Gathering. We will have King’s Grace to provide music for our morning session. Lynn is working with Rev. Rick Vernon to see if we can get the 902 Praise Band for our afternoon session. (See NOTE 1 below). We all agreed to have the Richlands Piggly Wiggly Deli to cater our noon meal as they did last year. Lynn will speak to them and give them a firm number once we determine how many will be attending. Once all the music is finalized, Lynn will develop a poster for churches to use in advertising the event. Each church should advertise the event as widely as possible. Lynn also mentioned that he had spoken with Rick Vernon about another time slot on his show to advertise our event. (See NOTE 2 below). It was also suggested that we advertise in the News & Observer in order to get greater coverage. Jack Mumford suggested we look into advertising in the “Our State” magazine. Although it is probably too late to get something published in this magazine before our event, Jack suggested we look to advertise DHF of NC in the magazine in the future. It was recommended that we have Rev. Kenny Conner to preside over Holy Communion at the close of our event. We will identify others to serve at each Communion station as we get closer to the date. Since FCC Richlands is the host Church, it was recommended that we have their Board Chairman, or Rev. Ray Randall to open the event and welcome everyone, and to lead in the opening prayer. We will ask FCC Richlands to take care of registration at the door. Following our business meeting, we welcomed Rev. Wayne Kent to speak to the group. Wayne played the piano and Leslie led the group in singing two hymns; Great Is They Faithfulness, and Amazing Grace. Wayne spoke about his early years in ministry working in missions throughout Eastern Europe. He was Pastoring FCC Decatur, Ill. when DHF actually began in 1985 and has been actively involved with DHF throughout its history. Over the years he has seen his church in Decatur, Ill. grow from around 200 to 2,500. As the Executive Director of DHF, Kevin wants to use the Pastoral and technical resources available within the Church in Decatur to reach out and help churches to address whatever challenges they need help with in order to adapt to change, remain viable and to grow. Wayne emphasized that the age old problem of organizations doing the same old things the same old ways and expecting different results is a recipe for failure. Although the Gospel never changes, the methods for reaching the unchurched in today’s society have to change if the church expects to grow. Wayne spoke about how new-Church Pastors have one major focus, and that is “finding people” to bring into the church. In the beginning, that is the number one focus. The next focus is bringing those people together for worship, and then following with Education in the Bible. Once the church is going well the attention naturally turns to Administration and the money. This phase is followed by a focus on the church building program. Lastly, after twenty years or so the focus turns to caring for those members who helped found the church and get it going. All along, as the church works through each phase the tasks of the minister increases to encompass all the priorities that have been developing along the way. At the end, most of the minister’s time and energy is spent caring for the church, and very little focus is applied to “finding people” like it was in the beginning. When the focus of finding new people is lost, the church begins its inevitable slide towards its eventual closure. This all seems so basic, but in reality, the task of “finding people” requires a lot of commitment by everyone in the church, as well as a lot of innovation and change to keep the church viable and growing along the way. Wayne pointed out that what works in one community and culture is different from what works in another. The emphasis must be on exploring what works in your community, and then the whole church working at that one thing with a lot of energy. We all thoroughly enjoyed Wayne and Leslie’s time with us and are enthusiastic about working with them in the future. Much thanks to Judy Maxwell for the great refreshments she provided for the meeting. Our meeting was closed in prayer by Lynn Maxwell. I was not able to secure the 902 Praise Band for this year’s Gathering; however, I texted Wayne and Leslie and they agreed to do a music session in the afternoon. I was also able to get Mr. Tracey Whaley of FCC Richlands to sing a couple of songs for us also. So, we are covered for music. Rick Vernon has advised me to call and set up a taping for Sep. 5th. I will use this opportunity to advertise our Gathering. This entry was posted in DHF of NC Happenings, Posts on August 27, 2018 by dhfofnc. Rev. Wayne Kent and his wife Leslie will be joining us for our Sat., Aug. 18th meeting of the Leadership Council. The meeting is scheduled for 10:00 am at FCC Richlands in the Social Hall. The Council will meet for a short business session from 10:00 – 10:30. We need to discuss plans for our upcoming Fall Gathering. We also need to review nomination forms received to replace two Leadership Council positions due to normal rotation. Please submit or bring your nomination forms to this meeting. We have invited Church Leaders/spouses to attend our meeting in order to meet with Rev. Kent. The session to meet/greet Rev. Kent and Leslie will begin at 10:30 am. Refreshments will be served. Please note that I posted an incorrect date for our upcoming Fall Gathering. The correct date is Sat., Sep. 22, 2018 at FCC Richlands. This entry was posted in DHF of NC Happenings on August 11, 2018 by dhfofnc.